So if sauerkraut is high on your list of food faves, you should give this a try. It's seriously everything you want a sauerkraut casserole to be! In a large skillet, melt the butter. Slice sausage into coins and saute over medium heat until browned. Add onions and garlic. Continue to saute a few minutes longer,, until onions have softened. Meanwhile, add remaining ingredients to a large bowl. Add sausage mixture and toss all ingredients until well combined. Pour all into a casserole dish, and cover with foil. Bake for 45-60 minutes, or until the potatoes are tender. Can serve with a big dollop of sour cream, if desired. Note- if you want to save a little time, chop your potatoes into smaller chunks. Larger pieces take longer to cook! As always, whenever I'm making a casserole, the amounts in the recipe are just guidelines. If you like a lot of onions, add a lot of onions! If you worship in the house of garlic, go for it! Make it the way YOU like it! Not a fan of kielbasa? Add any other kind of sausage you like! Of course it would be great with hot dogs. You could even do it with chunks of boneless pork! Yum. I always prefer fresh herbs to dried, but if you only have dried herbs, use 'em! I would say probably just about a half tsp of each, but add as much or as little as you like! Another variation would be to add a diced apple to the onions as you saute. That would be a delicious hit of sweet with the sour! Hmm.. I think I'll do that next time! Oh, btw, I didn't rinse the sauerkraut. I always feel like that just washes away all that delicious flavor. But if your palate finds sauerkraut to be a bit harsh, then by all means give it a good rinse! At this time of year, I always feel a little bummed out that our summer produce will be gone for a while. Since I live in The Garden State, every summer I'm lucky enough to have access to some of the best produce you'll ever taste! And then come September, I have to say goodbye to them and spend seemingly endless months looking forward to next summer's crop. Honestly, if you've never had Jersey Corn and Jersey Tomatoes, you are not living your best life. And the peaches... OMG THE PEACHES. Frankly, I've never met a peach ANYTHING that I didn't like, and I'm forever looking for new and different things to make with them. So, as this summer comes to a close, I find myself wanting to do one more peach recipe before saying goodbye to them until next summer. But what to do? I've already done cakes, pies, jams, and cobblers, but I wanted to do something NEW! (or at least new to me!). And then I thought of my slow cooker. This was definitely the way to go! Seriously, if you don't have a slow cooker, you NEED to get one! I literally have 4 of them (in different sizes) and I use ALL of them! So it made perfect sense to find a peach recipe that uses one. This is a recipe that I found on a blog called Recipes That Crock, only I tweaked it to use fresh peaches. It turned out just as perfectly as I had hoped! SO GOOD! (and it made my whole apt smell HEAVENLY!) When I sent out a text to my gang of friends asking if anyone would like to have some cobbler, my friend Nate's response was "Oh God, YES.". LOL He was an immediate fan! And of course, you MUST serve it with vanilla ice cream. I'm pretty sure that's a law. So if you love fresh peaches as much as I do, give this recipe a try. It's really crazy simple to throw together, and I know you'll love it!! Peel and slice peaches. Place them in a bowl with the lemon juice and 1-2 tbs sugar depending on how sweet your peaches are or how sweet you like your cobbler). Toss to coat peaches, set aside. Place melted butter in the bottom of your slow cooker. In a mixing bowl, stir together remaining ingredients. It will the consistency of a thin pancake batter. Pour the batter over the butter. Do not stir. Spoon the peaches (including any accumulated juices) over the batter. Again, do not stir. Place a paper towel or clean tea towel under the lid to catch any condensation. Cook on high for 2 hours or until cobbler is set. Serve with vanilla ice cream. This recipe can be prepped in advance, and then kept in the fridge until it's time to bake. It's a great way to free up the oven if you have other things to bake! I purposely didn't specify how many peaches to use. Just add as many as you like on top of the batter. (or as many as will fit, depending on the size of your slow cooker). If you don't have fresh ripe peaches, you can definitely use canned peaches, including the syrup. Just omit the sugar and lemon juice. Although I haven't tried it yet, I'm sure this recipe will work perfectly with other kinds of fruit. Of course, apples would be my first choice, but I bet you could use any variety of fresh or canned fruits or any combination of fruit. Be creative!! Ok, so, it's the end of summer and you have a ton of zucchini, tomatoes, and basil from your garden and you have no idea what to do with them, am I right? Well, this is absolutely the recipe for you! Actually, even if you don't have a garden or a ton of zucchini and tomatoes, this is still the recipe for you! I saw it in one of those Tasty videos that is bouncing around social media and it looked easy, so I gave it a shot. I must say, it really is, well, quite TASTY! It's also very quick to make, so it's perfect for a midweek meal. And yes, as you can see there's no pasta in the dish. It's just ribbons of zucchini masquerading as pasta, which is great news for anyone who may be choosing cut down on carbs. On the flip side, if you want to add real pasta to it, go right ahead! It'll be awesome! So no matter how you decide to make it, I know you'll absolutely love it. It's definitely just the thing when you want one last taste of summer before the cooler weather rolls in! In a food processor, combine the basil, Parmesan, pine nuts, garlic, lemon juice, salt, pepper, and olive oil. Pulse until smooth texture. Set aside. With a vegetable peeler, shave ribbons of the zucchini until you reach the seeds. Set aside. Slice the cherry tomatoes and set aside. Heat a skillet over medium high. Add a little oil to the pan, the chicken breasts, and sprinkle with salt and pepper. Cook until the chicken is cooked through and browned on all surfaces. 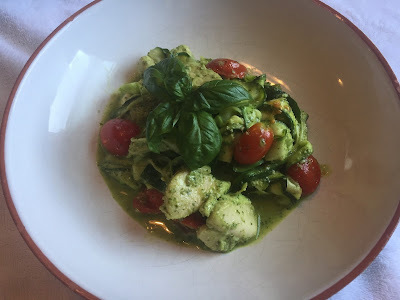 Turn off the heat and add the cherry tomatoes, pesto, and zucchini ribbons. Toss until well combined and heated through. Honestly, I wouldn't change a thing. It's so fresh and flacvorful, just make it as is, and you're good to go. If you want to take a little shortcut, you could use jarred pesto sauce, but fresh is always so much better. If you want to make it a meatless dish, simply leave out the meat! It'll be delish either way! Ok, so here's a deliciously easy recipe that is fresh and light and perfect if you want something that isn't too heavy. It's the perfect mid week dinner because it doesn't take long at all. Just toss everything together on a sheet pan and pop it in the oven. Easy! I recently made it for a group of friends and everyone loved it. The key to the dish, in my humble opinion, is the sesame oil. Total game changer! In fact, I would absolutely choose to make a different dish rather than make this dish without it. It's just that important! Also the brown sugar and lime juice are just the things to balance each other out. It's so flavorful, EVERYONE went back for seconds. No leftovers at all! Oh, btw, I should point out... when I first discovered this dish, it was called Hawaiian Style Sweet and Sour Roasted Pineapple and Bell Peppers. Frankly, I think that name is TOO LONG, and since I decided to add other veggies, I decided to shorten it ever so slightly. I'm sure the folks over at Vegetarian Times won't mind that I tweaked their recipe just a bit! Enjoy! Preheat oven to 400°F. Arrange pineapple cubes and veggies on ungreased rimmed baking sheet. Drizzle with toasted sesame oil and vegetable oil, sprinkle with brown sugar, and season with salt and pepper, if desired. Toss to coat. 2. Roast pineapple mixture on center oven rack 30 minutes, or until lightly browned, turning once. Remove from oven and sprinkle with sweetened coconut flakes, if using, then drizzle with lime juice. Remove to serving bowl and toss well to combine. Serve hot or at room temperature. To make this a main course, I served this over rice with roasted shrimp. It was a huge hit! For a little added texture, sprinkle with chopped macadamia nuts, pistachios, or pine nuts.